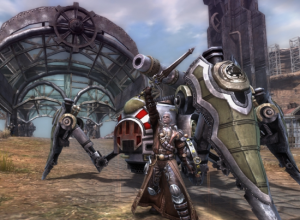 Black Gold Online (BGO) is a free-to-play MMORPG with first and third person shooter elements. The game was developed by Mental Games and is client based. The game was inspired by myths and ancient civilizations throughout the world. It combines a mechanized, gothic world of steam with a majestic world of fantasy where more than 3,000 dynamic events and actions can change the game world. Players are able to use mechs and beasts in combat, depending on which faction they choose to support. This creates a huge variety of fun and different encounters for both PVE and PVP play experiences. Hidden dungeons full of treasure. Lots of instances with queue to enter. Beautiful game world inspired by real civilizations. Most events require the use of the mechs to finish without dying. The PVP systems favors those with good computers. 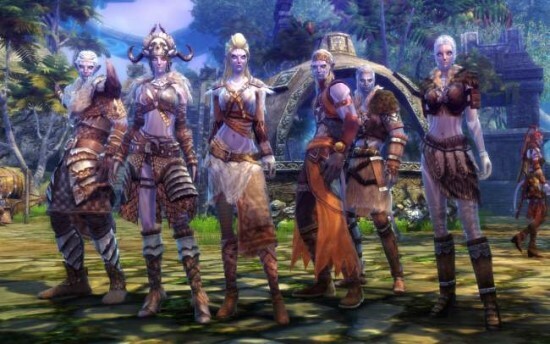 Low-end players have difficulty getting mobs and other players to appear. To start off players are given a set of preset character looks to choose from. From there they can change them in a variety of ways to be as customized as they like. 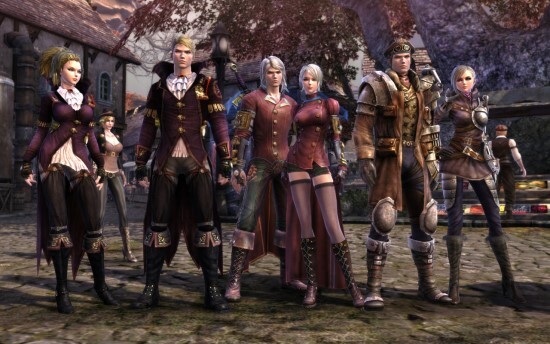 Black Gold features a character creation system similar to Age of Wushu, the same engine this game uses. The players can choose from like 12-15 faces and use sliders to modify the appearance in every way from the face to the body and hair. This allows for a truly unique character from the start. There is also many colors to choose from on the body and hair of the characters. Black Gold features two main factions that are locked in a never-ending war for the precious resource from which the game was named after, Black Gold. The first faction is the Isenhorst Kingdom, which is populated by humans and dwarves who use Black Gold to power their many machines of steam and way of life. The other faction is the nature loving Erlandir, who reside in the forests around the world of Montel. The Erlandir are humans and an Avatar inspired race known as the Kosh. Buvontian – The Buvontians are the humans who were exiled from Erlandir due to their way of life using steam powered mechanisms. They cast aside the old ways of worship, and followed the Dwarves in their creation of Isenhorst to pursue technology. They became the rulering nation of Isenhorst. Erlongdia – Affected by the Kosh’s Curse of Blood, some humans were transformed into something different. This new race became known as the Erlongdia Vampires. Not much else is mentioned about this race as it is not yet playable. Dwarves – The Lokemean Dwarves are stubborn and optimistic. This race is filled with individuals forsaking the gods for science and technology. Their energetic focus led to the development of the world’s most advanced steam technologies. Kosh – The Kosh are known as “The Children of the Sun” because they worship the Sun God. By harnessing the powers of the elements granted by the Sun God, this blue skinned race has managed to rule the western continent for centuries. Aurek – A race of barbaric shape shifters who reside in the forests of the western continent. They are powerful and can transform into beasts with great prowess. Although they are under the influence of the Kosh, they are independent yet allied with Erlandir. Yutonians – My personal favorite race is the Yutonians. This is a race of humans who stayed true to the ways of worship and are under the protection of the Kosh. Although much smaller in size comparing to their Buvontians, the Yutonians have managed to enhance the powers of the forests into a weapon to fight against the Steampunk side of Isenhorst. Each class uses one of the 4 armour types; Cloth, Leather, Medium (chain), and Heavy (plate). Depending on the role of the class, the players will have different armour sets. Black Gold has a strong emphasis on the mechanized combat system. Starting at level 10, the players will be given a quest that allows them to get their first mech or beast to fight with. For the Erlandir these are often warbeasts, dragons, and quick wolf mounts. The Isenhorst on the other hand uses machines powered by Black Gold ranging from walking robots, gyrocopters, to massive tanks. This is one of the main features of the game as many of the events cannot be finished without using a mech to help defeat the objective. The PVP system also favors those who use the mechs to fight with, since they can do a lot more damage to an unmounted player. Many of the PVP battlegrounds will have mechs stored in the key areas, especially when the objective is capture the flag. Although, the players must be unmounted in order to capture the flags around those maps. Another unique feature of the mech combat system is the ability to upgrade them to fit the players personal style. Each mech or beast has about 8 upgrades total, ending with a very powerful version of the original. After the first 4 or 5 upgrades, each mech branches off into two different types of mech under the same basic style of mech. What this does is allow for different skills for the mech and different strengths and weaknesses. For example, a siege mech is only really good for destroying buildings and fighting unmounted and NPC characters, whereas a flyer can easily decimate grounded targets, with exception to the anti-flyer type of mech. The game includes three types of mechs: land, air, and water. Over 32 total battle mounts exist, with 18 being personal and 14 specifically for the game’s Energy Well battles. The only limitation that I seen on mechs was that they cannot be used in instances and dungeons unless the dungeon required the use of the mechs. 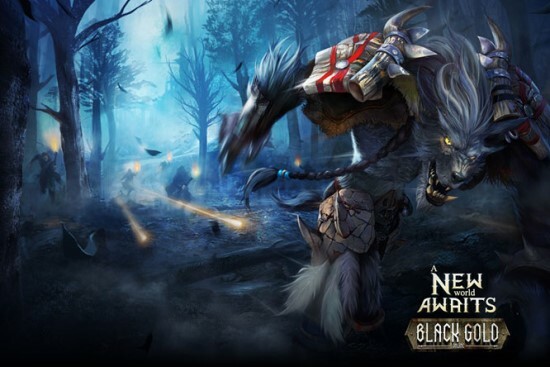 Black Gold has a great focus on large-scale team battles and offers enormous open world PVP battles between the two factions. Players can directly attack each other without warning or requiring the permission of the targeted player. Almost all of the hidden dungeons are shared between the two factions, allowing for them to run into each other inside while searching for treasure and start fighting while still fighting the dungeon’s mobs. This spices up the gameplay greatly, and makes every player weary of their surroundings. There are also large-scale world events like tower sieges and the Energy Well battles, which turn a whole map into a battlefield. There is always a big fight going on between the two factions somewhere around the world. As the player grows in level, they’ll find themselves being involved in PVP more and more as they try to do quests and fight over the Black Gold. Although the game offers a lot, it does contain several things that may hinder a player’s enjoyment of the game. For starters, the mounted players will always win against those unmounted. There is also some audio issues with the cut scenes, as well as them not always allowing the “skip” function as they always show you can skip it. However, there is a lot to do in the game and if you can manage to learn the controls of the mechs, you’ll find yourself enjoying this game very much. I myself found it easiest to not try turning while in battle mode, but to instead back out to third person mode (by CTRL) and turn that way. Some of the controls while mounted can be sluggish so that’s how I had to control the mechs in order to join in the large fights. Just note, that you cannot fight in third person mode while mounted. Customization, battle mounts, dragons and tanks, many classes and races, large scale open world PVP, many hidden dungeons and treasure in all, and most of all BLACK GOLD, what’s not to like? I personally recommend trying this game out as it can be very enjoyable once you learn the controls! Thank you for reading this Black Gold Online review. You might also like reading our Top MMORPG 2014 List or some of our other MMO game reviews. The reviewer played the closed beta of BGO. The game’s open beta is on June 20, 2014. Kindly leave a comment below or share/tweet this post if you enjoyed reading it. Please note that all comments are moderated so they will not appear instantly. Wow! What an awesome sounding game. I would love to try it out. Interesting game my grandchildren would love it.